I’m sitting in my backyard under our new gazebo, as my kids play in the sandbox to my right. They’re mostly behaving, until someone accidentally knocks over a dump truck filled with sand. I have a love-hate relationship with summer. I love sleeping in and the relaxed pace, but I also miss my work time. It means I have to be more creative with how I get things done, and blogging out here while I keep an eye on my cuties is one of them. One of the things I started this month was a free Stamp of the Month class, open to anyone who placed an order with me for $25 or more. 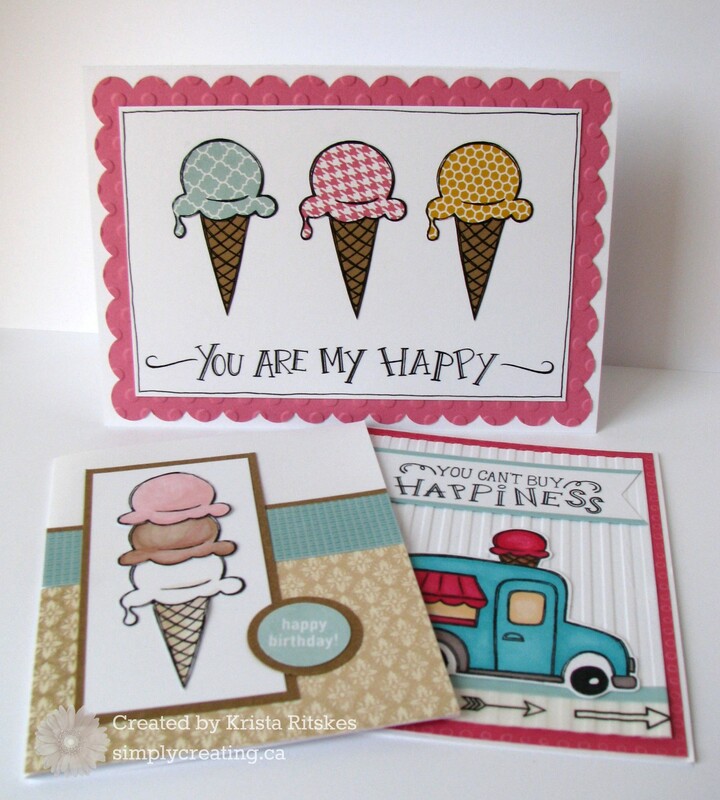 You saw one of the cards in my blog hop post here. Here is a photo of all three projects we created. 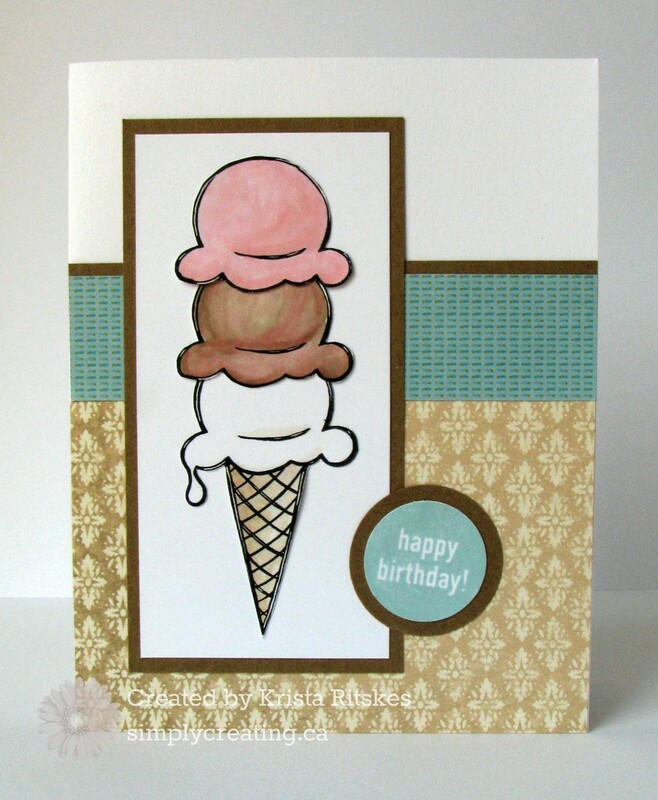 As you can see, the ice cream cone was my favourite of all the images. We focused on different types of colouring in line images. The truck image was coloured with our Shin Han markers. Here are the photos of the other two cards, along with where I got the ideas for them. This card was fun to make, using Paper Fundamentals. 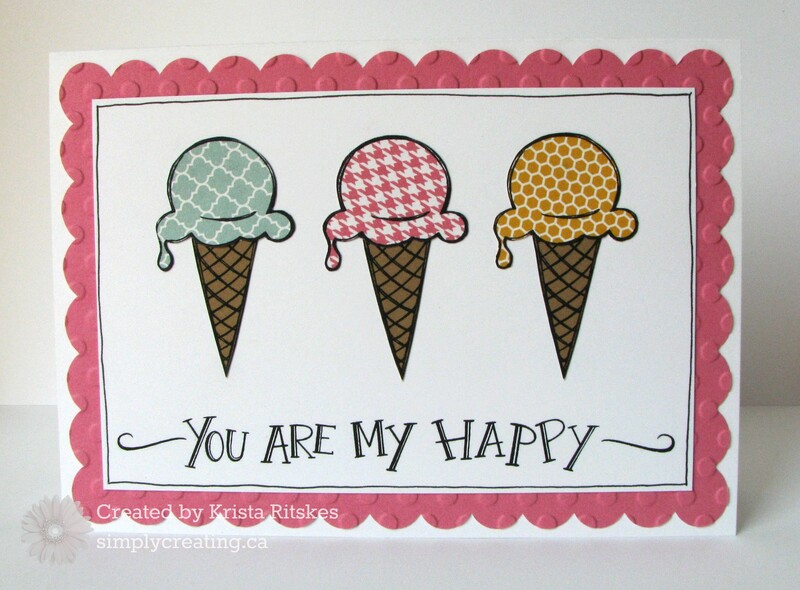 We stamped the image on three different colours of paper and trimmed them out and glued them into the ice cream images of the cones stamped on the White Daisy. This technique is called paper piecing and I love using it. I got the inspiration for this one from the fabulous Dana Kessler. Check out her version here. This card was also fun. We used our ink pads and a water brush to add colour to the stamped images. I drew a little line on the top two scoops so I could cut off the drip. This one is inspired by Lisa Plummer’s lovely card. You can check that one out here.